Noon - 3: Visit this delightful congregation during their 100th year anniversary! Noon - 4pm: Grab freshly grilled food as you view materials from Church of the Master's Literacy Fair. Literacy is about financial literacy, health literacy and life skill literacy as well as free books for kids. Noon - 5pm: Stop in to see this fabulous neighborhood resource. Pick up a few tools at their tool sale. Learn some great tips for repairing your home. Discover all their services for home buyers! Noon-5:00: Housed in a fascinating old-timey fire house, the Cleveland Heights Police Academy is one of the best in the nation! Come see demonstrations of police dogs and other not-so-cuddly crime fighting equipment. There's a museum in this building, too! 1:00 and 1:30: Limit 25 people per tour: Join paintings conservator and our own Noble Neighbor, Wendy Partridge to view the 1930's WPA murals inside Oxford School. She'll describe more about the WPA which put artists to work during the Great Depression and about the conservation work that ICA Art Conservation performed on these murals. Sponsored by ICA Art Conservation and Cleveland Heights-University Heights City School District. 1:00-3:30: Board Lolly the Trolley at Hope Lutheran Church, 2222 N. Taylor for an historical tour of the Noble neighborhood. Sponsored by RE/MAX Traditions, Howard Hanna and Keller Williams real estate groups, and by Heights Community Congress. 2:00-4:30: Visit Noble Road Presbyterian Church between 2:00 - 4:30pm and support their children who decided that the way they wanted to participate on April 26 is by raising funds for other kids at St. Jude Children's Research Hospital. Discovery Preschool, which is housed inside this church, invites you to their open house. 2780 Noble Road. All Afternoon: Some streets and areas are creating yard sale clusters of several sales in proximity. 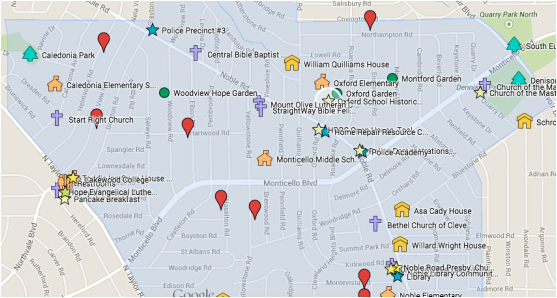 Check out the Potter Village neighborhood just southeast of Taylor and Monticello. Find Quilliams Parkway, the neighborhoods just north of Oxford School. Look for Randolph, Medford, Vineshire, Oxford, Allston, Beverly, Ardoon and Montford sales and more! When you click here you'll reach an interactive map. You can turn on and off layers to focus on certain features and locations. Find the layers for the April 26, 2015 real estate open houses and special events! Click here to download a printable map of our April 26 events. Real estate open houses, yard sale locations and special events are listed here as of Thursday, April 23 at noon. Click here for the interactive map with the most up-to-date information. So many good things happened in our neighborhood today! [April 26, 2015] So many, so many. Favorite comment, from Realtor: "You folks have done a fabulous thing here today. You've showed new buyers what a wonderful, friendly, neighborly place this is. Tell us when you have your next event. We'll be there!" More feedback: "Yesterday's Noble Neighbors event was powerful! Today is a day for rest and then we will all look forward to continuing the momentum we gained yesterday to support this wonderful community." "It was wonderful to see a good number come to see the murals plus hydrocal panels and ceramics at Oxford. They were all quite interested in what the treasures that Oxford has. Several even commented that it was a shame that the fire alarm was not placed on the other side of the door; it "ruins" the Pied Piper. I commented that the person who did that must agree with the architect of the 1970's renovation and not appreciate WPA art. So many people have not known about this art at Oxford so I'm glad that they now know. People who knew of them but hadn't seen them since the restoration were surprised at the bright beauty. Wendy Partridge did a nice job giving the information needed to understand and appreciate the murals, etc. Of course, I do have to admit that I am not unbiased about them." "Sunday was a huge success! " "We had fun in the neighborhood today. We got to meet Vin the police dog, we missed the trolley, but the ice cream truck saved the day!" "Thanks! We had a lot of good traffic on Sunday, and I heard a lot of good things about the event as a whole. Congratulations to you and all those involved!" "Thanks to the volunteers who organized this impressive event. Well done!" "The Oxford El WPA mural presentation was fantastic and well attended! Thank you Wendy Partridge for sharing your expertise!!" "Thank you for organizing! We had a blast on Oxford Road!!" "What a great day Sunday you did good the April 26 movement you should be proud." "What a beautiful job you have been doing! and congratulations to a successful day on Sunday." "We were able to drive around and enjoy a number of small garage/yard sales and talk to a lot of neighbors -- what a beautiful day we got! I also know of several neighbors whose homes hve been for sale for a long time, and they had open houses, and were actually getting traffic. So it was a great idea and well received (and Mother Nature was nice enough to cooperate). I hope we can do this again!" "Congratulations on our event this past Sunday!! Your positive attitude and energy has spread throughout our community and we THANK YOU! We all have wonderful stories and we constantly praise you for making so much happen over the last year. It is so encouraging!" "It was a fabulous day! Many thanks to all who helped plan and put it on!"